Signs of spring are all around us now. For most people it is the warmer weather, more hours of daylight, return of the robins, ice going out of Lake Tomah, and more walkers and joggers out on our streets and sidewalks. It was a bit different for the Scheckel family in the 1940s and 1950s out on Oak Grove Ridge in the middle of Crawford County. Yes, we had our longer days, warmer weather, winds out of the South, robins in the yard and tulips poking through the ground on the south side of the house. We watched for the barn swallows returning to build their mud nests clinging to the rafters in the Small Barn. Our Spring included skunk cabbage and water crest. Skunk cabbage pops up early in the season. We would find skunk cabbage down in the Kettle Creek valley often when there was snow and ice on the ground and we would be cutting trees for logs, fence posts, and burning in the furnace. Kettle Creek is the same valley where we ran about 30 head of cattle during the late spring, summer, and into early Fall. For you city folks, “ran” is the place the young cattle grazed and watered and licked the salt block. We didn’t actually run after the cattle, nor did we make the cattle run. 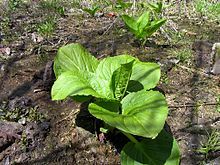 Skunk cabbage is partial to lowland places and water-ladened soils. It develops a reddish-purple flower that hangs low to the ground. The shape of the flower resembles a milkpod that we would see later in the year, usually along roadsides. Leaves develop after flowering is over. Big green leaves, resembling, you guessed it, cabbage. That’s when the fun begins. Snap off a leaf and rub it between thumb and fingers, and you will swear you are in the presence of a SKUNK. As kids, we wondered how a plant could smell so baaaaddd. We had Chrysanthemums, or mums, and roses, and hollyhocks, around house and gardens. Those were good smelling flowers. There must be a reason, so I had to look it up. Certain pollinators, such as scavenging flies, stoneflies, and bees are attracted to the “stinker.” The foul odor in the leaves discourages large animals from disturbing the plant and damaging it. The obnoxious smell is not harmful. It is not poisonous, like poison ivy or nettle. For the three Scheckel boys, skunk cabbage was a sure sign of spring and lots of fun to play around with.